Fast Dell OptiPlex 790. OptiPlex 790 Tower Desk Top PC COMPUTER Network Card DESKTOP PC COMPUTER Wifi Ready. 790 C.O.A. Integrated 10/100/1000 Gigabit Ethernet. Dell Primary Drive or Optical Drive. Model: Optiplex 390/790/990. 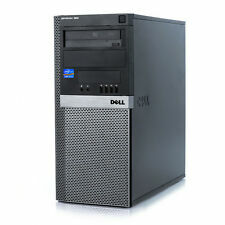 (1) Dell Optiplex 390/790/990. Hard Drive Capacity 128GB SSD. Wifi Included Yes. (1) USB WIFI Adapter. Form Factor SFF / Desktop. Most printers go to the refurbishing process after the order is made. Dell OEM Installation CDs Included Genuine Microsoft Windows software preinstalled. - 1 Rear Audio Line In Jack. - 1 Rear Audio Line Out Jack. - USB Mouse. Don't be fooled by Original Manufacturer (ex. ). Fast Intel Core i5 Processor! 6GB RAM (1x4GB, 1x2GB). Up for sale is a used HP Pavilion h8-1210t(a5u29av). The machine is in good working order. The specs are as follows. Dell 9010 Optiplex. - 120SSD Solid StateDrive installed with Windows 10 HP 64. - Dell OEM Installation CDs Included Genuine Microsoft Windows software preinstalled. o Windows 10 Professional 64bit. 500gb SSD installed with Windows 10 HP 64. - Dell 9010 Optiplex. - Dell OEM Installation CDs Included Genuine Microsoft Windows software preinstalled. Don't be fooled by Original Manufacturer (ex. ). 120GB "NEW" SATA Solid State Drive installed with Windows 10 hp 64. - Dell OEM Installation CDs Included Genuine Microsoft Windows software preinstalled. Don't be fooled by Original Manufacturer (ex. ). 1TB Hard Drive installed with Windows 10 HP 64. - Dell 990 Optiplex. - Dell OEM Installation CDs Included Genuine Microsoft Windows software preinstalled. Don't be fooled by Original Manufacturer (ex. ). Dell OEM Installation CDs Included Genuine Microsoft Windows software preinstalled. - 1 Rear Audio Line In Jack. - 1 Rear Audio Line Out Jack. - USB Mouse. o Windows 10 Professional 64bit. Don't be fooled by Original Manufacturer (ex. ). And 2TB Storage Hard Drive. 120gb Solid State Drive. HP 8200 Elite Desktop Computer PC Tower. 8GB Ram DDR3. Genuine Microsoft Windows software preinstalled. Windows installation CD and new COA included. Dell 9010 Optiplex. - 120GB SOLID STATE DRIVE installed with Windows 10 HP 64. - Dell OEM Installation CDs Included Genuine Microsoft Windows software preinstalled. o Windows 10 Professional 64bit. Dell OEM Installation CDs Included - Dell UltraSharp 1708 LCD Monitor. Genuine Microsoft Windows software preinstalled. - 1 Rear Audio Line In Jack. - 1 Rear Audio Line Out Jack. - USB Mouse. o Windows 10 Professional 64bit. Dell OEM Installation CDs Included Genuine Microsoft Windows software preinstalled. o Windows 10 Professional 64bit. Don't be fooled by Original Manufacturer (ex. Dell) disks. with the ORIGINAL COA. Dell 9010 Optiplex. - 500GB SSD Solid State Drive installed with Windows 10 HP 64. - Dell OEM Installation CDs Included Genuine Microsoft Windows software preinstalled. o Windows 10 Professional 64bit. Dell 9010 Optiplex. - 240SSD Solid State Drive installed with Windows 10 HP 64. - Dell OEM Installation CDs Included Genuine Microsoft Windows software preinstalled. o Windows 10 Professional 64bit. 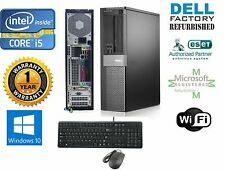 Dell Desktop Computer Quad i5 3.10ghz Windows 10 hp 64 1TB HD 8gb Wifi DVI 19"
FAST Dell Optiplex 990. OptiPlex 990SFF PC DESKTOP COMPUTER Network Card SFF PC DESKTOP COMPUTER. 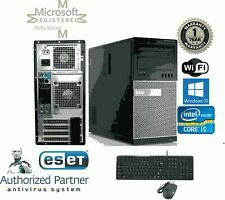 i5 2400 Quad 3.1GHz 4GB-250GB HDD CD/RW DVD-ROMWin 10 HP 64. Note: No promotional Product or software designed to slow performance of your Dell PC. Fast Shipping! Customize Your Own! Dell OEM Installation CDs Included Genuine Microsoft Windows software preinstalled. - 1 Rear Audio Line In Jack. - 1 Rear Audio Line Out Jack. - USB Mouse. o Windows 10 Professional 64bit. Item specifics: You will get 2 unit. Complete HP i5 System! Fast Shipping! 1 Year Warranty! Custom Built Gaming PC Intel i5, R9 380, everything included except the monitor. GPU: 950 MHz Gigabyte AMD Rageon HD 6970 2GB @ 1450 MHz (R697OC-2GD). RAM: Kingston HypperX Limited Edition 4x2GB @ 1866 MHz 9-10-9-28-1T (twice KHX1600C7D3X1K2/4GX). Optical Drive: LG GH22NS70. 120GB SOLID STATE DRIVE. Fast Dell OptiPlex 790. OptiPlex 790 Tower Desk Top PC COMPUTER Network Card 790 C.O.A. Dedicated Graphics DVI HDMI. Dell Primary Drive or Optical Drive Genuine Microsoft Windows software preinstalled.